We’ve seen the beautiful churches, impressive stately homes, and the big extravagant marquees, but how about something different for the big day? We have a bunch of alternative venues for Brides and Grooms for the more unique wedding day. If you’re planning on doing something completely different for your special day, then help is at hand. Perhaps getting married in a church or hotel doesn’t quite cut it for you? Sometimes the standard big white wedding isn’t everybody’s cup of tea and you’re looking for a venue that will have your guests talking about it for years to come! We have researched and rounded up the most unique venues in the UK, some weird, some wonderful, and have created an ultimate top ten list. Have a look through the list and find some of the most outlandish venues in the UK, from zoos, to windmills along with many other non-traditional settings. So for those wanting something to blow their guests away or simply looking for something that bit different then look no further. Read below and get yourself some quirky inspiration for your upcoming wedding. If you and your partner are looking for that out-of-the-ordinary wedding day but still fairly traditional then take a look at this beautiful hotel. Steeped in history, the Waterton Park Hotel is a truly enchanting venue due to its gardens and the captivating Georgian architecture which is surrounded by a twenty-six-acre lake (only accessible by a picturesque iron bridge). Situated in West Yorkshire, this majestic location provides the perfect backdrop and can host to up to 200 guests giving you and your partner that unique and special day you’ve always dreamed of. Ever fancied getting married in a cave? 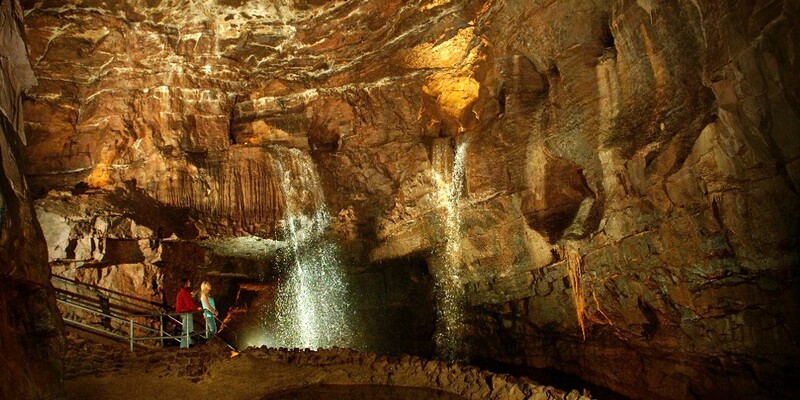 Well look no further, we have found you just the place at - Dan-yr-Ogof, the National Showcaves Centre for Wales. Both licensed for wedding ceremonies and civil partnerships, couples can get married in the Cathedral Cave known as the ‘Dome of St Paul’s’ where two large waterfalls flow 40 feet into a magnificent underground lake. Not only is the venue unusual but also provides spectacular wedding photographs amidst the caves. The Cathedral Cave can host up to 38 guests, and for the smaller more intimate weddings the Dan-yr-Ogof Cave can hold up to 20 people. This wedding venue is certainly different and perhaps fit for couples looking to get married on the water, making the Yacht number 8 on our list. Hop on board The Yacht London, located on the River Thames, and say your vows surrounded by your loved ones with a beautiful view. The Yacht can hold up to 200 guests over 3 decks and allows a truly impressive wedding, whether it be an open air ceremony or a more sheltered one with a marquee on the top deck covering you for all seasons. The interior of the Yacht is decorated in an Art Deco style and allows the celebrations to continue into the early hours of the morning (until 3am). This quirky venue is definitely for couples who are looking for something a bit more individual, and want that beautiful London Thames backdrop to complete the special day. A rustic and unique wedding venue is something you can definitely count on at Alnwick Gardens. This picturesque venue has 2 receptions- The Pavilion and The Treehouse. The Treehouse is especially perfect for those looking for that more intimate wedding and wanting an outdoor setting beneath the woodlands. The Gardens provide an atmospheric backdrop for your vows, giving you that fairy tale wedding you’ve dreamed of, making it the ideal place for couples who are considering a contemporary garden wedding! Alnwick Gardens host ceremonies for 65 guests and receptions for 120 guests and is the perfect venue as let’s be honest who else can say they got married in a treehouse? We couldn’t complete this list without including the famous London Eye! We’ve all heard about people getting married here but do you know the details? 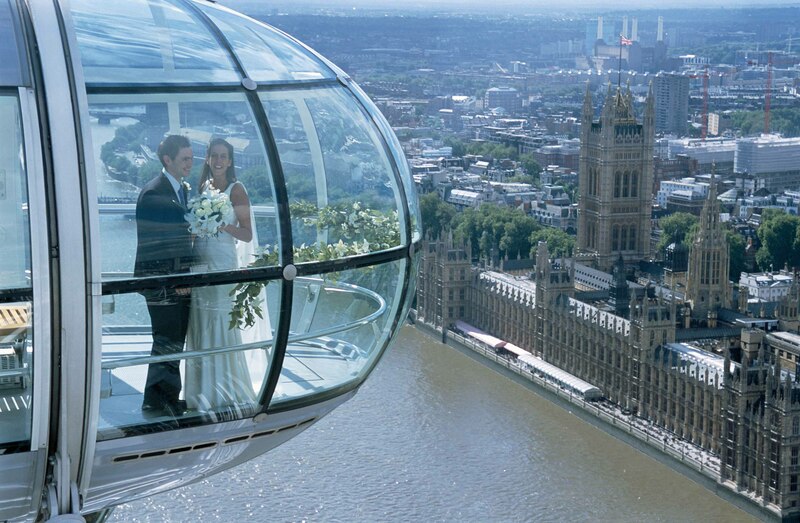 Get married to your loved one high in the sky, approximately 135 metres above ground level and say your vows with incredible views of London. Since 2002 the iconic London landmark has allowed couples to celebrate their wedding day in the most magnificent and memorable way. If you’re a London lover or maybe have grown up in the UK’s capital, then there is nowhere else that can compete with this incredible wedding location. During the wedding ceremony you couple can enjoy two rotations on the London Eye, with the first turning for the ceremony and signing of the register and the second to take in the views and relax in style! This venue is not short of the wow factor allowing you to have that eccentric wedding day. If you’ve ever thought of getting married in a windmill, then look no further! This wedding venue, situated along the Norfolk coast, is a definite on our list of unique wedding venues. 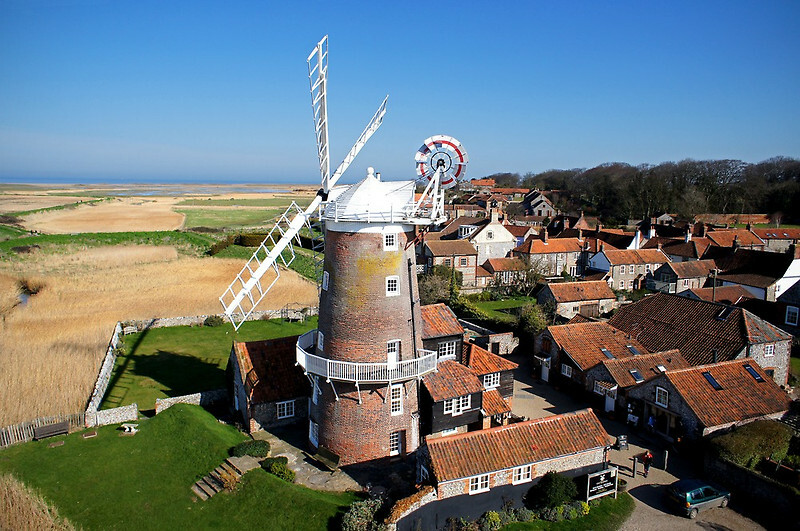 The Cley Windmill is licenced to hold both wedding receptions and civil ceremonies for up to 20 people. So if you want a more intimate wedding day with a beautiful backdrop then this venue is for you. Not only will you get amazing photos of the day but the beach is a short distance away, meaning you can capture your special day on the coast too. The unusual setting of this venue is what sets it apart from other venues, conveying that fairy tale feel. For all London lovers we have found another place for you! The Gherkin- the building we all know well from the apprentice and the one that does indeed look like a Gherkin. If you fancy a 360-degree view as you say your vows, then this is the building for you. 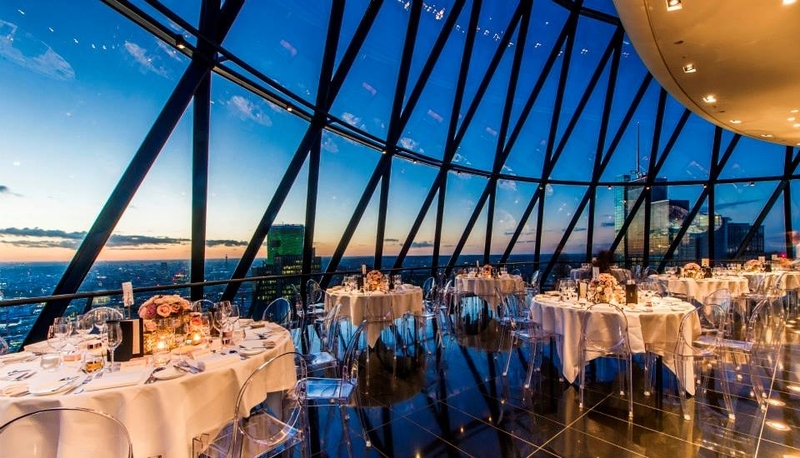 This setting is not your typical wedding venue, however it provides spectacular panoramic views of the city’s skyline making it without a doubt one of the most impressive venues in the UK. 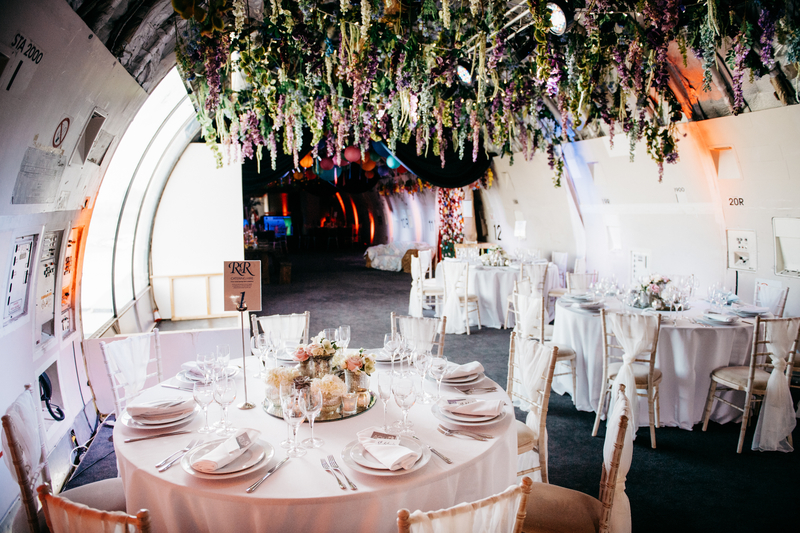 The London landmark can hold 140 for a seated ceremony or 260 standing and offers private dinner rooms for the more intimate wedding, where you can be sure to see the sweeping skylines of London. The National Marine Aquarium is certainly one of the wackiest places to get married in the UK. Whether you or your partner love all things to do with the ocean or simply want to do something different for the special day then the National Marine Aquarium is the place for you. 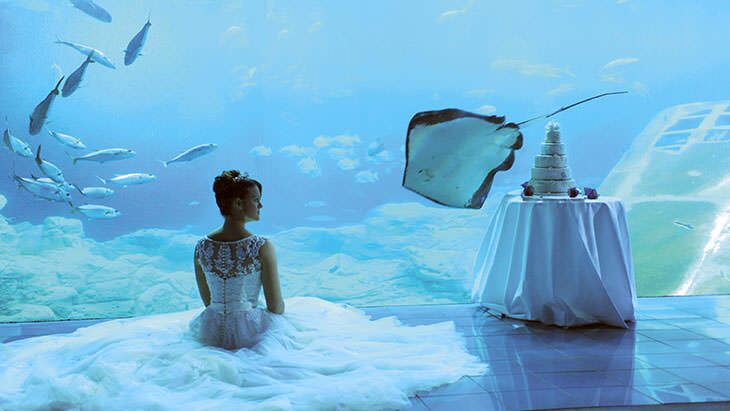 Located in Plymouth, this venue suited for those wanting a wedding more outside of the box, allowing couples to get married in the shark tunnel or the reef exhibit, both providing a truly remarkable backdrop. This enchanting setting will 100% leave an impression on your guests and will have people talking about your wedding for years to come. 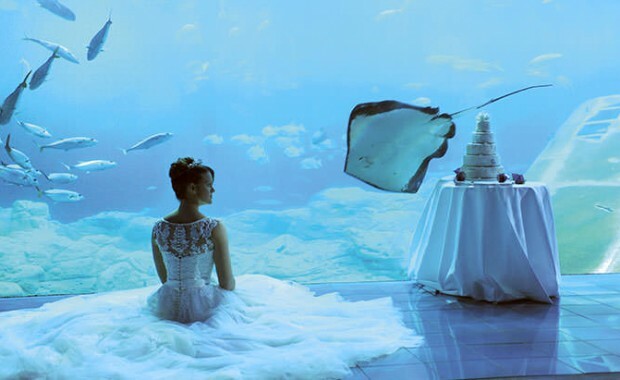 So for those who want to get married under the sea, this is the venue for you. Our number 2 wedding venue must go to the Party Plane! Have your special day in none other than Cotswold Airport. Brides and Grooms can now say 'I do' on board a converted Boeing 747 or even in the operational Control Tower. Couples who don’t want to conform to the traditional wedding will be amazed at this venue. With both the control tower and the Boeing licenced for civil ceremonies, you can make sure that your wedding day will be a very memorable one. The vast Boeing 747 has been stripped out and used to host various events, and has now been permitted to hold weddings, making it not only a unique wedding reception but also gives you the ultimate jet fuelled celebration! So for any plane fanatics out there this is the venue you need to book for your wedding day! Calling all animal lovers, our number 1 spot goes to the iconic setting that is ZSL London Zoo. 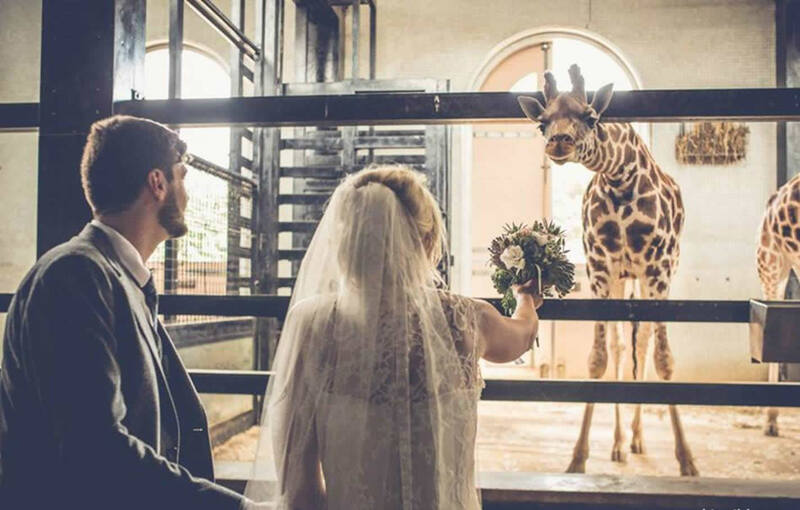 Marry your loved one in style at UK’s most impressive Zoo (also the world’s first ever scientific zoo). What better place to start off your special day than London ZSL, providing a unique and beautiful backdrop for your wedding day. This venue has made it as our top spot in the list of alternative weddings due to its special access to the Zoo that day (whether it be at penguin beach or tiger territory) along with directly contributing to international conservation charity, supporting the global conservation of animals and their habitats. A win win situation we’d say! Visit our Britannia hotels and view some of the wedding venues that are on offer this 2018/2019.